Current main research interests are chemical structure, function, and dynamics of natural organic matter, in particular humic substances, dissolved organic matter (DOM), and black carbon (C). An accumulation of organic matter or C in soil is very important in both aspects of global C cycle/balance related to global warming and improvement of soil fertility (plant production ability). Stabilization process of soil organic matter and relationship between degradation rate and structural property of natural organic matter are studied. Effects of forest type, land use type, or soil type on the quality and quantity of DOM and DOM-metal complex, which are exported from pedosphere to hydrosphere and essential for maintaining aquatic ecosystems, are also investigated. Other research topics include dynamics of silicate in a rice paddy and sustainable agricultural use of tropical peatland. Ikeya, K., Sleighter, R.L., Hatcher, P.M., and Watanabe, A. 2015: Characterization of composition of soil humic acids using Fourier transform ion cyclotron resonance mass spectrometry. Geochim. Cosmochim. Acta, 153, 169-182. Kawasaki, S., Ikeya, K., Sugiura, Y., and Watanabe, A. 2015: Changes in the composition of humic acids in various upland field soils with a continuous organic amendment as revealed by fractional precipitation analysis. Soil Sci. Plant Nutr., 61, 450-460. Watanabe, A. 2015: Cultivation management and environment. In The Sago Palm―The Food and Environmental Challenges of the 21st Century. Ed. The Society of Sago Palm Studies, p. 191-198, Kyoto Univ. Press, Kyoto, Japan. Watanabe, A., Ikeya, K., Kanazaki, Y., Makabe, S., Sugiura, Y., and Shibata, A. 2014: Five crop seasons’ records of greenhouse gas fluxes from upland fields with repetitive applications of biochar and cattle manure.J. Environ. Manage., 144, 168-175. Watanabe, A., Tsutsuki, K., Inoue, Y., Maie, N., Melling, L., and Jaffe, R. 2014: Composition of dissolved organic nitrogen in rivers associated with wetlands. Sci. Total Environ., 493, 220-228. Forest ecosystems have been globally recognized as a sustainable resource. In spite of this, environmental changes such as global warming and environmental pollution as well as unsuitable forest management continue to pose a serious problem. The research objective of this laboratory is the development of optimum sustainable management of forest ecosystems with regard to economics and environment. The studies are based on remote sensing, geographic information system (GIS), environmental chemistry, plant physiology and forest measurement. Mathematical modeling for sustainable forest management. 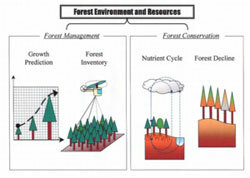 Evaluation of forest resources and environment using GIS and remote sensing. Development of a new methodology for forest measurement. Diagnosis of forest decline using physiological symptom found in affected plants. Nutrient cycle in forest ecosystem affected by environmental changes. Phytoremediation of metal-contaminated soils using trees. Behavior of radiocaesium in forest ecosystem. Miyahara M, Takenaka C. Tomioka R. and Ohta T., (2011) Root responses of Siberian larch to different soil water conditions. Hydrological Research Letters 5:93-97. Hayakawa N., Tomioka R., Takenaka C. (2011) Effects of calcium on cadmium uptake and transport in the tree species Gamblea innovans Soil Science and Plant Nutrition 57(5):691-695. Takenaka C., Hayakawa N., Kobayashi M., Kanaya S. and Tomioka R. (2011) Accumulation and transport of heavy metals in Gamblea innovans Jpn. J. Forest Environment, 53: 1-15. Yamamoto K., Kobayashi K., Nonoda T., Inoue A. and Mizoue N. (2010) Effect of settings of digital fisheye photography to estimate relative illuminance within forest under low light conditions. Journal of Forest Research 15: 283-288. Assoc.Prof. TANAKA, Takafumi D. Agr. d43034a@cc. The main goal of research in this laboratory is to understand the water, energy, CO2, and other mass cycles, and the relationships between these cycles and the biome. The main subjects of our research and education are forest/mountain hydrology, forest/mountain meteorology, and soil erosion control engineering. Water, energy, and CO2 exchanges between the atmosphere and the biome in multi-scale The results of this research will contribute not only to the understanding of water, energy, and CO2 exchange processes in spatial scales of from a leaf, canopy to region, and the effects of physiology on these cycles, but also to the prediction of global changes. Evaluation of water cycles on a watershed scale The water cycle system is investigated using several experimental watersheds. The results will contribute to both the physical understanding of run-off systems and the prediction of landslides and debris flow. Hydrometeorological characteristics of sub-alpine mountains The hydrometeorological conditions of sub-alpine mountains are quite different from those in hilly mountains. Our main goals are to estimate the spatial and temporal distributions of meteorological elements throughout the year, and to understand snow accumulation and ablation processes in high mountain areas by using a new model and remote-sensing data. Hydrometeorological characteristics of urban environment In urban or suburban areas where human activities change land surface conditions variously, hydrometeorological effects of complex land use including urban vegetation are investigated. Sediment yield in a mountain watershed The characteristics of sediment yield from a watershed, and watershed conditions such as vegetation, topography, and geology, are investigated. Our results will contribute to watershed management and river planning. Ohta, T., Hiyama, T., Tanaka, H., Kuwada, T., Maximov, T. C., Ohata, T., and Fukushima, Y. (2001) Seasonal variation in the energy and water exchanges above and below a larch forest in Eastern Siberia. Hydrological Processes, 15, 1459-1476. Matsumoto, K., Ohta, T., Irasawa, M., and Nakamura, T. (2003) Climate change in extending the growing season of Ginkgo biloba L. in Japan. Global Change Biology, 9, 1634-1642. Hamada, S., Ohta, T., Hiyama, T., Kuwada, T., Takahashi, A., Maximov, T. C. (2004) Hydrometeorological behavior of pine and larch forest in eastern Siberia. Hydrological Processes, 18, 23-39. 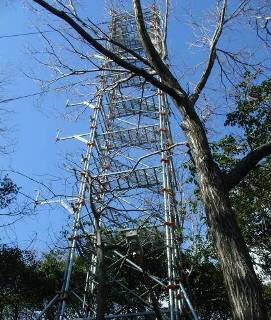 Tanaka, T., Hattori, S. and Park, H. (2004) Measurement of forest canopy structure by a laser plane range-finding method. Improvement of radiative resolution and examples of its application. Agricultural and Forest Meteorology, 125, 129-142. Kotani, A., and Sugita, M. (2005) Seasonal variation of surface fluxes and scalar roughness of suburban land covers. 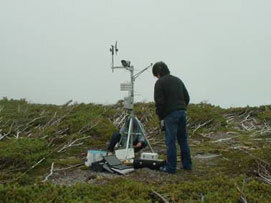 Agricultural and Forest Meteorology, 135, 1-21. Matsumoto, K., and Ohta, T. (2005) Evaluation of the effect of leaf physiological activity on the behavior of stomata by using leaf chlorophyll concentration. Agricultural and Forest Meteorology, 132, 44-57. Toba, T., and Ohta, T. (2005) An observational study of the factors that influence interception loss in boreal and temperate forests. Journal of Hydrology, 313, 208-220. Maeda, K.,Tanaka, T., Park, P., and Hattori, S. (2006) Spatial distribution of soil structure in a suburban forest catchment and its effect on spatio-temporal soil moisture and runoff fluctuations. Journal of Hydrology, 321, 232-256. Kotani, A. and Sugita, M. (2007) Variance methods to estimate regional heat fluxes with aircraft measurements in convective boundary layer. Journal of Hydrology, 333, 68-85. Studies of our laboratory cover a wide range of research themes closely relating to forest ecology, forest genetics, and tree ecophysiology. Co2 gas exchange and dry matter production. Wang, H., Matsushita, M., Tomaru, N., and Nakagawa, M. (2015) Differences in female reproductive success between female and hermaphrodite individuals in the subdioecious shrub Eurya japonica (Theaceae). Plant Biology: 17: 194-200. Tokumoto, Y., Sakai, S., Matsushita, M., Ohkubo, T., and Nakagawa, M. (2014) Spatiotemporal variability in the reproductive success of the continually flowering shrub Dillenia suffruticosa in Borneo. Biotropica 46: 583-590. Inanaga, M., Nakanishi, A., Torimaru, T., Nishimura, N., and Tomaru, N. (2014) Distance-dependent but genetically random mating in a Japanese beech (Fagus crenata) population. Botany 92: 795-803. Yoichi, W. and Tomaru, N. (2014) Patterns of geographic distribution have a considerable influence on population genetic structure in one common and two rare species of Rhododendron (Ericaceae). Tree Genetics & Genomes 10: 827-837. Ogawa, K. (2012) Mathematical analysis of age-related changes in leaf biomass in forest stands. Canadian Journal of Forest Research 42: 356-363. Our research aim is to clarify biotic and abiotic factors responsible for biological phenomena and ecological events in forest ecosystems, which could have various effects upon the health and sustainability of the ecosystems, including biodiversity. Ecology, forest sciences, and evolutional biology are fundamental knowledges in our research fields. Conservation of herbaceous and forest ecosystems based on the management of biological communities. Kobune S, Kajimura H, Masuya H, Kubono T (2011) Symbiotic fungal flora in leaf galls induced by Illiciomyia yukawai (Diptera: Cecidomyiidae) and in its mycangia. Microbial Ecology 63: 619-627. Yoshida T, Hijii N (2011) Microarthropod colonization of litter in arboreal and soil environments of a Japanese cedar (Cryptomeria japonica) plantation. Journal of Forest Research 16: 46-54. Fukumoto H, Kajimura H (2011) Effects of asynchronous acorn production by co-occurring Quercus trees on resource utilization by acorn-feeding insects. Journal of Forest Research 16: 62-67. Ishikawa H (2011) Effects of dung beetles on seedling emergence from herbaceous seeds in the dung of sika deer (Cervus nippon) in a temperate Japanese grassland ecosystem. Ecological Research 26: 725-734. 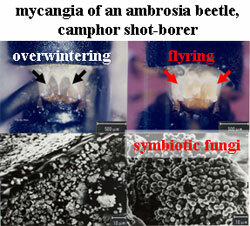 Kawasaki Y, Ito M, Miura K, Kajimura H (2010) Superinfection of five Wolbachia in the alnus ambrosia beetle, Xylosandrus germanus (Blandford) (Coleoptera: Curculiondae). Bulletin of Entomological Research 100: 231-239. Ito M, Kajimura H (2009) Genetic structure of Japanese populations of an ambrosia beetle, Xylosandrus brevis (Curculionidae: Scolytinae). Environmental Entomology 38: 1324-1335. Mizuno T, Kajimura H (2009) Effects of ingredients and structure of semi-artificial diet on the reproduction of an ambrosia beetle, Xyleborus pfeili (Ratzeburg) (Coleoptera: Curculionidae: Scolytinae). Applied Entomology and Zoology 44: 363-370. Karasawa S, Hijii N (2009) Oribatid communities (Acari: Oribatida) associated with bird's nest ferns (Asplenium nidus complex) in a subtropical Japanese forest- a mini-review. Trends in Acarology (MW Sabelis, J Bruin eds): 149-153. Harada, K., Prabowo, D., Aliadi, A., Ichihara, J. Ma, H.O. (2015) How can social safeguards of REDD+ function effectively to conserve forests and improve local livelihoods? A case from Meru Betiri National Park, East Java, Indonesia. Land, 4: 119-139. Yokota, Y., Harada, K., Oktalina, S.N., Rohman, Wiyono, Tanaka, M. and Inoue, M. (2014) Contribution to participant's livelihood by community collaborative forest management system in Java, Indonesia- A case study in Madiun. East Java. Japan Agricultural Research Quarterly, 48(3): 363-377. Harada,K. and Wiyono (2014) Certification of a community- based forest enterprise for improving institutional management and household income: A case from Southeast Sulawesi, Indonesia, Small-scale Forestry, 13(1): 47-64. Harada, K., Rohman, Silvi, N. O., Wiyono (2012) Exploring potentials of forest certification for community-based forest management in Indonesia. Journal of Forest Economics, 58(1): 58-67. Ratsimbazafy, L. C., Harada,K. and Yamamura, M. (2012) Forest resources use, attitude, and perception of local residents towards community based forest management: Case of the Makira Reducing Emissions from Deforestation and Forest Degradation (REDD) Project, Madagascar. Journal of Ecology and the Natural Environment, 4(13): 321-332. Ratsimbazafy, L. C., Harada,K. and Yamamura, M. (2011) Forest conservaton and livelihood conflict in REDD: A case study from the corridor Ankeniheny Zahamena REDD project, Madagascar. International Journal of Biodiversity and Conservation, 3(12): 618-630. The major research interests of this laboratory are to understand the biosynthesis and chemical properties of lignin, cellulose, hemicellulose and extractives. Isolation and structural elucidation, determination of the biosynthesis, and visualization of the distribution of wood extractives. Visualization of the distribution of flavonoids in Larix kaempferi wood by fluorescence microscopy, Y. Kawanishi, N. Bito, R. Nakada, T. Imai, Mokuzai Gakkaishi, 61, 297-307 (2015). Isolation and structural elucidation of norlignan polymers from the heartwood of Cryptomeria japonica. Y. Yanase, K. Sakamoto, T. Imai, Holzforschung, 69, 281-296 (2014). The accumulation pattern of ferruginol in the heartwood-forming Cryptomeria japonica xylem as determined by time-of-flight secondary ion mass spectrometry and quantity analysis. K. Kuroda, T. Fujiwara, K.Hashida, T. Imai, M. Kushi, K. Saito, K. Fukushima, Annals of Botany, 113, 1029-1036 (2014). The cryo-TOF-SIMS/SEM system for the analysis of the chemical distribution in freeze-fixed Cryptomeria japonica wood. K. Kuroda, T. Fujiwara, T. Imai, R. Takama, K. Saito, Y. Matsushita, K. Fukushima, Surface and Interface Analysis, 45, 215-219 (2013). Clonal variation in heartwood norlignans of Cryptomeria japonica: evidence for independent control of agatharesinol and sequirin C biosynthesis. 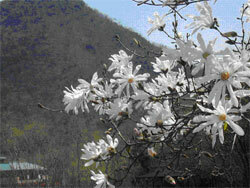 N. Bito, R. Nakada, E. Fukatsu, Y. Matsushita, K.Fukushima, T. Imai, Annals of Forest Science, 68, 1049-1056 (2011). In vitro hydroxylation of a norlignan: from agatharesinolto sequirin C and metasequirin C with a microsomal preparation from Cryptomeria japonica. T. Imai, K. Asai, M.Takino, K. Fukushima, Phytochemistry Letters, 2, 196-200 (2009). Heartwood extractives from the Amazonian trees Dipteryx odorata, Hymenaea courbaril, and Astronium lecointei and their antioxidant activities. T. Imai, S. Inoue, N. Ohdaira, R. Suzuki, Y. Matsushita, M. Sakurai, J. M. Henriques, S. K. Ozaki, Z. Finger, K. Fukushima, Journal of Wood Science, 54, 471-475 (2008). Discriminating the indistinguishable sapwood from heartwood in discolored ancient wood by direct molecular mapping of specific extractives using time-of-flight secondary ion mass spectrometry. K. Saito, T. Mitsutani, T. Imai, Y. Matsushita, K. Fukushima, Analytical Chemistry, 80, 1552-1557 (2008). Application of ToF-SIMS to the study on heartwood formation in Cryptomeria japonica trees. K. Kuroda, T. Imai, K. Saito, K. Fukushima, Applied Surface Science, 255, 1143-1147(2008). Field measurement of the growth stress in 16-year-old Eucalyptus plantation in Southern Brazil. 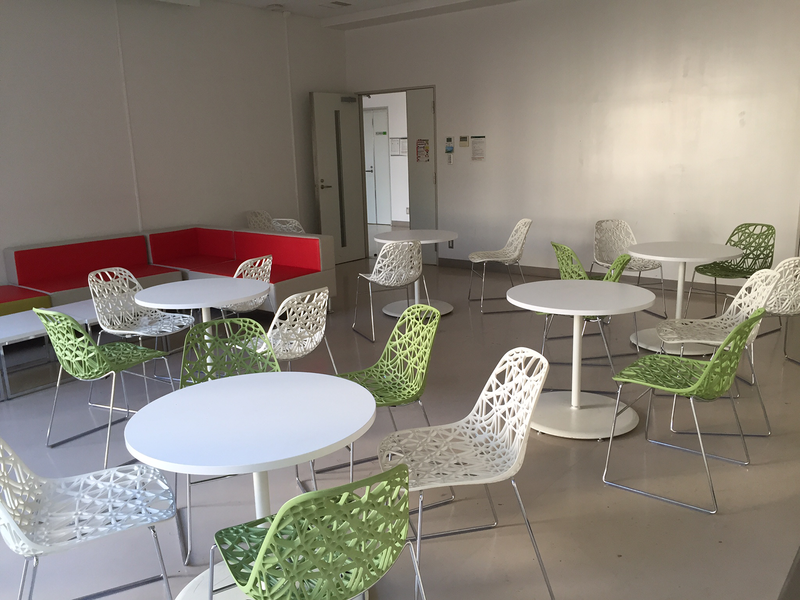 Experiment in our laboratory – Approaches by Molecular biology and SEM observation. The major research objective of BMP is to understand the material properties of wood as well as to clarify the processes of tree growth and cell wall formation, from the physical point of view. Methodology extends over the physical, mechanical, chemical, anatomical and computing methods. Recent our research covers the following topics. (1): Biomechanics of the living tree: Generation of growth stress and its biological meanings are investigated by means of the field measurement, laboratory analysis, and computing mechanics. (2) Generation mechanism of the physical properties of wood cell wall: Material testing, electron-microscopic observation, UV-micro-spectrophotometry, X-ray diffraction analysis, molecular biology, as well as theoretical modeling, are employed to make clear the diversity in the physical properties of wood cell wall. (3) Growth properties and wood qualities of tropical fast-growing species: Wood qualities and maturation properties of tropical fast-growing species are investigated in relation to their rapid lateral growth rate. Our research fields extend over many countries, e.g., Indonesia, Malaysia, Philippine, Brazil, French Guyana, Australia, Argentina, and so forth. The mechanical behavior of wood and wood-based materials in pure and combined stresses are investigated. This research focuses on the influence of the loading states on the strength and deformation in the evaluation of the mechanical characteristics of wood under static and dynamic loading, for example, Poisson’s ratio, fatigue life, and fatigue limit. The mechanical durability is discussed by energetic and reaction kinetics approaches. Large-scale inputs of forest resources into urban areas will need to be taken into consideration for the foreseeable future. Urban areas that enjoy the multiple services provided by forests have an obligation to actively promote wood utilization in their design. To help fulfil this obligation, we have launched a research group called “Wood Urban Design Project”. Its purpose is to engage in cross-sectional collaboration toward a fundamental solution to the problems faced by the forestry and timber industries. We discuss the project’s ambit and the problems that may be faced in the effort to revitalize forest and forestry. A method of estimating Young’s modulus of wood-member by measuring only stress wave velocity is newly developed (Japanese patent: 2007-232698). When the method is used, density measurements are not needed. 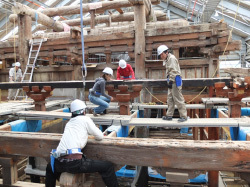 Historical timber construction is inspected with special concern with their structural safety.